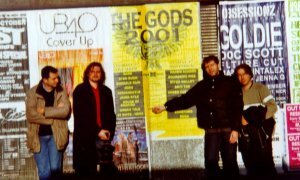 As AOR-Europe was unable to send a reporter to the Gods 2001, arguably the most important AOR festival of the year, we thought "what could be the next best thing?". 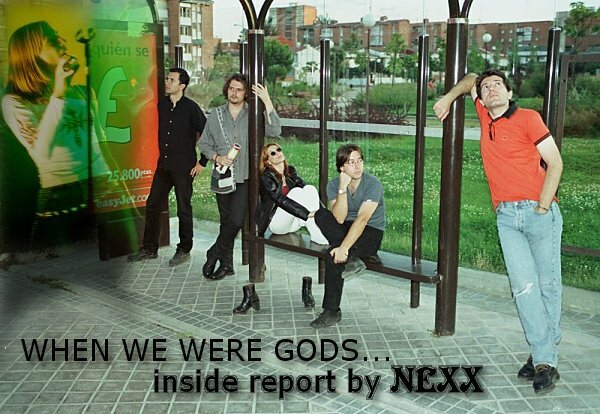 Well, as it happens, we were able to lure Fran from the up'n coming Spanish band Nexx to provide us an inside report! Read what it feels like for a relatively unknown band to rub elbows with the "gods" of AOR! Here it is, pretty much "unedited". Fran even does a mini-review of the latest Dare album inbetween the road stories! It's been more than a month since the Gods of AOR and, to be said, it seems that it happened a year ago, or maybe it was just a dream. I'm listening in cycle mode the last Dare album, which the rest of the band gave me for my birthday. "Silent Thunder" is one of the best songs I've listened these days. We met in the airport two hours before the flight departure. We were a little bit worried about the future of our instruments in their first air travel, thou the excitement for going to the Gods was stronger and everything was laughin' and good feeling. As it ever happens when you travel in group, somebody have to make a new passport in the airport cos he has lost his that day... typical stuff. Apart from the members of the band and the boss, Jose Herrera, there were some friends, girlfriends and some spanish people that went to the festival too, they flew with us and supported us all the time. There was also Bruce, from Now and Then, that was all the weekend smiling, taking photographs and asking us if there was any kind of problem with whatever. So, we check our precious instruments, we prayed for them and it was time to fly! "White horses", what a great song. The flight was very comfortable, even for the newbies. Patricia and her chorizo's sandwich had a huge impact in her close passengers, that went all the travel with that spanish chorizo smell. We weren't very nervous but, anyway, there was no turn back. We began to realise the reality of our country: Spaniards don't talk, just shout! At last we landed at the John Lennon Liverpool airport, small and easy to find. Incredible, it was not raining. The big Spanish troop splinted up and we waited for our minibus to go to our hotel. Meanwhile we asked Bruce for the new Harem Scarem album and more gossips. We had to do a different chapter for our bus drivers. All the weekend these two guys helped us a lot, taking us from the hotel to Maximes and then come back. They helped us with the all the instruments and they put all the weekend some kind of radio therapy with Ten and The Beatles, just for us getting used to Liverpool. But the accent was so strong that it was a little bit difficult to understand them sometimes... anyway... very nice people. The first night we stayed in Ashton, a little village near Wigan. We drank our fist pints of beer in a karaoke pub and we begun to think that we had a real problem with the food, cos, to be honest, you never eat so good as in your own home. We ate some hormoned cloned chicken and straight to the bed. We had to change our hotel that morning, so after a little walk and a small bus trip we got to the new hotel, closer to Wigan, which was our operation centre for the whole weekend. We went to Wigan to see the town and we could try a fantastic cholesteroled British breakfast at 4 o'clock in the afternoon. Some of us didn't leave a gram of grease. The centre of the town is small but nice to have a walk. Then we came back to the hotel, woke up Patricia, who was sleeping, and went to the AOR party at Maximes. But before that, the dinner, with some healthy hamburgers... maybe it's true that entire thing about the Mediterranean diet. There we met a lot of Spanish people, and yes, definitively, in group, we shout louder. After a friendly chat with the burger manager, that had to come down twice to see what happened there, we decided to go to The Tavern, a pub near Maximes. By the way it was crowed. When we enter, suddenly Big Daz took Patricia in a huge hug that raised her up 1 meter off the ground... yeah, the ambience was getting warmer. A band was playing, but with all that noise we couldn't hear them anything. In the Tavern I could met with the people of the chat of melodicrock.com and I could see that they were real humans, no ghosts of the cyberspace, also they are very nice people, Sue, SurfPunk... As the pub was so crowed, we went to Maximes. The music was great, melodic rock classics and good new things. We could check that whenever a Journey song is playing, people go mad. The look of the people was like stolen from a video clip from the mid 80's. The loudest shirts and the long hairs were all around. Kieran, our friend from Fireworks, wore some kind of silver shirt.... er.... I've got no words... LOL! Great. The venue was getting full and everybody was so excited for the great weekend it was going to be. Beers everywhere, I know some Spanish mate who drank one per band playing during the festival... with some extra ones! We were talking with our friends of House of Shakira. 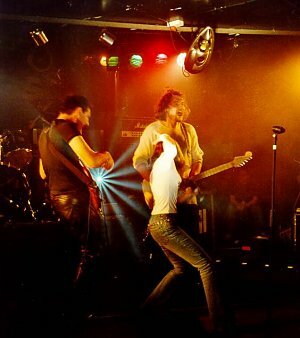 Per and company are great guys and we remembered when they came to Spain to play at the Nemelrock and the following party in Vallecas. There were lots of musicians, fans, people from Now and Then, and the party lasted till late for lot of people. We had to go early cos the next morning we had to play. We woke up early, cos at 11:00 the bus came in and we had to have everything ready. Last look at the set list, warming the hands, make up for her, nervous for the boss, where's that electric adapter, take the demo CDs, rooms like jungles, cigarettes for the vicious ones and take the bus that we're going. It was starting to rain softly. It's true, in England it rains. We finished and we felt like "I want to play 2 hours more", but rules were strict, and the timetable had to be on time. When we got out of the dressing room we couldn't believe that. A lot of people with our demo CD looking for a sign, we had to sign in a passport! Some magazine, a couple of radios... incredible... even in our best dreams we couldn't imagine that reaction... I think our grand children will listen to this story a lot of times. We sold out the 60 CDs we took that day. We went to the hotel to change clothes and we came back to see the Nordic Urban Tale and House of Shakira. Great. The evening passed fast, in a blink of an eye, watching good bands playing good music. Terry Brock was huge, and I'm not talking about his height. He did a memorable set, full of emotion. Then Dare! My girl and I went to the first line... By the way, now it's playing "Belief", nice tune. But the day was ending.... We had known a lot of people that day, including some Japanese, of course. Without any doubt that's the best part of the festivals, meeting so many people that would be impossible to meet in other circumstances. The cab driver that took us to the hotel was the same than the last day so he was talking about his adventures in Spain... somebody had to tell this British people that Spain is bigger than the islands and Salou. LOL! C'mon to the bed. I was still raining... mmm maybe we played out of tune? This time we missed the breakfast... a pity. Well, at 12:00 we were at Maximes again... party continued. When we entered, Powerplay people took us some photographs... the dream was continuing.... On Sunday people woke up later, and the ones that were there were a little bit hang over-ed, but the bands started to play. After Hysteria, 91Suite came. These guys are great, they have very good songs and they played them with enthusiasm and lots of energy... It was a pity that the sound was not very good at the beginning of their set. Surely they will sell lots of copies of their brand new album, but the best thing is that when you talk to them they are ordinary people, like the people you meet at any university. When they finished, it was nearly 14 o'clock so.... Lunch time! Chicken with Indian spices was very tasty. After eating, we began to see the first people who lost the battle against beer and no-sleeping, some guy lying in a column, half slept half drunk... Anyway, people, during the whole weekend, were very well educated and the healthy ambience was a constant there. I can't help saying how charming people were with us. On Sunday there were people still taking pictures with Patricia.... She had to stay in a big bunch of photos. Mitch Malloy was absolutely fantastic. He came and left like a star. We stayed with Larry, drummer, lot of time of the day, and he's the most educated and kind person I've ever known, and the one who hits harder the drums! We knew him, a week before the Gods, due to we played as guest stars in the Mitch Malloy Madrid show. He, Adam and the bass player were still astonished how a Monday, at 3 o'clock late night, there are pubs in Madrid full of people. These guys will return to Spain for sure. After Bob Catley played, the Journey tribute came played by Urban Tale, which had a great set of Journey covers. People idolise Journey, yeah, we could check that there... they didn't stop singing during all the songs. 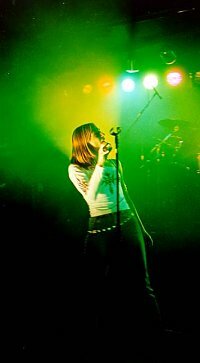 The songs were very well played, and apart from the Urban Tale singer, we got also Terry Brock, Darren Smith, Hysteria singer and Patricia, who sang "Send her my love". 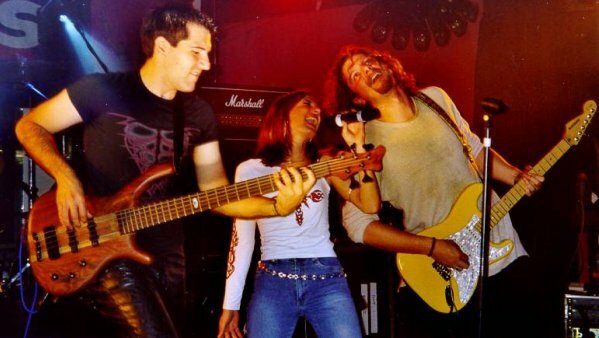 I don't know if I can explain my feelings in that moment, I mean, looking at your singer, a band without any album or record deal, singing with such big artists... wow... it was something similar in the Nemelrock festival when she sang with Harem Scarem. It was amazing. For our band that was the final gift of the party... What a great weekend!... But everything has to end. Peoples faces, though tired, showed happiness and while we were saying good-bye to our friends, the old and the new, we heard that "I'll come back next year". By the way, Spanish army couldn't shout anymore, we had lost our voice... "Take me away", I like that guitar. The organisation of the whole festival was almost perfect, and that is very complicated, even in a normal situation. The tragedy of September made that lot of American bands didn't go to the festival and we could guess what headaches had to suffer the organisation to replace them. Well, c'mon, let's go, to the hotel, to sleep and dream to come back anther year. "Dreams on fire".